The 2014-2015 opera season in Geneva kicked off with a really strong opener: a modern and well-balanced performance of a great favorite. Like Robert Carsen’s recent production of Falstaff which was shared by Milan, London, New York and Amsterdam, his Rigoletto premiered in Aix-en-Provence and is a co-production with Strasbourg, Brussels, Moscow’s Bolshoi and Geneva. Carsen did not came to Geneva for this staging and delegated it to one of his assistants. One probably misses the last-minute modifications that the Canadian director might have made in adapting to a new cast or because his vision would have evolved, but it enables a smaller opera house like Geneva’s Grand Théâtre to benefit from the originality and strength of the work of a major master. Here Carsen delivers a strong and powerful concept. His Rigoletto is set in a circus. Acrobats mix with the chorus and provide plenty of entertainment. A group of lightly clothed strippers play circus animals while Gilda’s room is a dollhouse trailer. While many of these can be seen as caricature, and while there were some elements in Act 1 that were perhaps too provocative and gratuitous, they served the purpose of highlighting the cruelty of the relations between the characters and helping us grasp the story. When the music and the action asked for it, Carsen knew how to relax the atmosphere. Gilda’s “Caro None” was sung against a delicately lit background while the soprano was on a glider. When the music was dramatic and energetic, Carsen’s many theatrical coups were a good match to Verdi’s flesh-and-blood music. 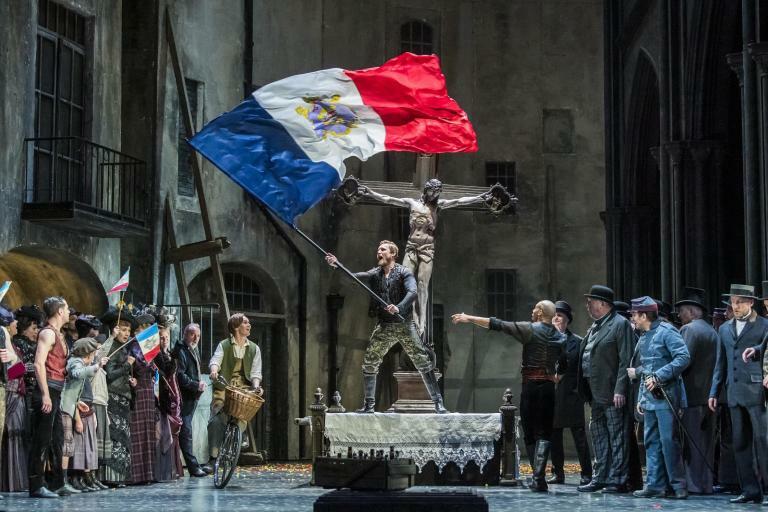 The Grand Théâtre assembled a solid, well-balanced cast with – more of this to come – a definite star in the making. The Duke was perhaps the weak link of the evening. Arnold Rutkowski struggled in the first act, and his top notes were not strong enough. But he carried through the evening and the quartet was well-balanced. Franco Vassallo had plenty of power in his voice and was more in his element in the imprecations of the second act than as the tender (and fearful) father of the first act. The secondary roles were well cast. Sami Luttinen was a menacing Sparafucille and his stage-sister, Ahlima Mhamdi, a member of the Jeunes Solistes of the Grand Théâtre, proved to have a solid technique, good articulation and great projection. In recent seasons, the Orchestre de la Suisse Romande has not always been in top form in the pit of the Grand Théâtre. This was not the case here. Alexander Joel’s pacing was efficient and dramatic. There was a strong sense of coordination between orchestra and soloists which audiences in Geneva have not experienced for a long time. There were some of the usual little problems, but overall the Orchestra played well. Geneva audiences should take advantage of the many performances to come. This is the sort of production to which parents should take their (teen-aged) children, to make them sense what a great dramatic form of art opera can be.